Ask The Bellwether: What is a Pocket Wheel? What is a Pocket Wheel? Spin-off collected names and contact information of custom wheel makers. I sent them two Washingtonian makers ... Betty Roberts (see this post) and Doug Dodd. Added 10 March 2009: I've been hearing that Mr. Dodd's website is down. His contact information was published in Spin-Off's Spinning Wheel Round-up, available from here. Click on "Download" there, not the Adobe PDF icon. You do have to make an account to get to that page, but that's free, and you needn't be a subscriber. I don't want to put it on this page, to save him from unwanted spam-bot mail. Added 10 March 2010: Jon has taken over making the Pocket Wheel. His new website (linked above) is http://www.pocket-wheel.com/home. Doug's Pocket Wheel had a big thread on the spindlers Yahoo group recently, I suppose because it is such a portable wheel, at just over 6 pounds. I own one of these -- or I should say, my daughter has claimed it for her spinning. It's a great little travel wheel, very light. It has its own flyer/bobbin -- the shaft is similar diameter to Ashford shafts (smaller than Majacraft shafts), but the bobbin is larger than Ashford's, it fits a good 4++ ounces on it -- I have 4 oz. of about 20 wpi singles on mine (don't tell DD -- I borrowed it for a cafe craft night) and it isn't full yet. The flyer is released by twisting the orifice (which is shaped a bit like a padlock -- big metal sturdy at the bottom, delta opening at the top, more delta than the usual U of a padlock, though) -- it's a pressure screw, not an actual screw. You give it 1/2 a rotation and then the flyer comes off, similar to the Fricke style (though they have a pressure screw separate from the orifice itself). 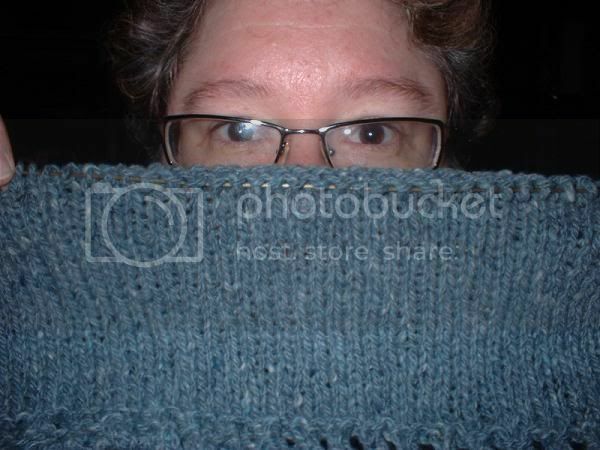 Then you take the bobbin off the shaft. You can take it apart -- the treadles and stand come off, and it fits in a grocery-bag sized tote. I just keep it together and use my wool-show-buyin' tote for it, or carry it as-is. It is a similar idea to the Hitchhiker in that it is a direct-drive wheel. Rather than changing out a set-location wheel for the ratio, though, you move the drive wheel up and down a metal rod to set the ratio -- so there isn't a "set list" of ratios, just anything you care to get, between a minimum and maximum (about 3:1 and 12:1, in the standard model). He's working on a new model that goes up to 15:1, as well. And I think they're showing up more on blogs and other places, as he gets more made and out there. Mine was #7, purchased last year :-) I guess you'd call me an early adopter. The Pocket Wheel isn't bobbin-led, rather, it's direct drive -- it uses scotch tension. A wheel rotates the flyer shaft (not the bobbin) by rolling against the big wheel that your treadle rotates. Louets' basic wheels are bobbin led, with a drive band that goes around the wheel and the bobbin. There is very strong draw-in on wheels like that. The Pocket behaves just like the scotch-tension, flyer-driven wheel that it is. The Scotch tension is around the back of the bobbin, so it's pretty hidden by the bobbin in pictures of the wheel that try to take it all in. Pocket: direct drive, officially any ratio from 3.5:1 to 10:1 (or so, mine goes a bit higher) by sliding the drive wheel along a shaft. Hitch: flyer rod/hooks comes out and stores in the foot. Pocket: flyer stays in place generally (when you remove it, just the flyer comes off, the flyer rod (aka spindle) stays on the wheel. You can undo the nuts that hold the treadles on and take off the treadles, stand, and flyer for more compact "tote-bag" storage. Both: present bobbin at an upward 45-degree angle, about the same height (my knees) if memory serves me okay. Hitch: either left-treadle or right-treadle. Pocket: double treadle. You wouldn't want to wear a long skirt and spin on it ... but I haven't had and problems in my jeans. Both have their own particular treadle considerations ... I find with any wheel, I need to learn its rhythm, and then I can simply treadle without thinking about it. The Pocket is fairly similar to my Majacraft, I've also heard it compared to a Jensen Tina. The Hitchhiker is heel-toe like the Journey Wheel. Hitch: standard footman leather (I think) connector of treadle to drive wheel. Pocket: has bearings that ride back and forth under the treadle, no footman connector used. Pocket: variety of woods used ... he takes some requests, but mostly is re-purposing woods. I love the patchwork of mine, but I realize others like consistency. These are current prices as I write this, "subject to change" as they say. Now, disclaimers ... I have only ever really played on a Hitchhiker; maybe filled 1-2 bobbins, and took some videos of how to put one together and take one apart. So it's not a wheel I have studied in depth. I've used my (DD's) pocket wheel a fair bit more. My new pocket wheel has just arrived!! (August, 2008). Pictures on flickr here!! Whew! Let me know if there's some attribute I've missed ... I'd be happy to expand this review. And if you have blogged about your pocket wheel, please post a link in the comments of this post so the world of spinning blog readers can find out more! Thanks! posted 24 May 2008 at http://askthebellwether.blogspot.com/ Last edited March 10, 2010. I just wanted to add on the Pocket wheel, with an $8 metal sleeve that Doug sells, I can use the bobbins from my Majacraft wheels, and the WW bobbins, as well as the bobbins from my Victoria, and WW bobbins. without the attachment, I can use my Lendrum standard bobbins from my Lendrum DT. Thanks so much for the comparison/ review. 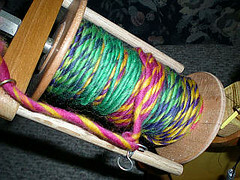 As you note, The HitchHiker uses bobbins and flyer which are Ashford Joy compatible and will accept a Woolee Winder unit. 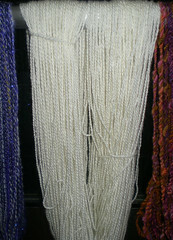 The standard bobbin holds 3-4 oz. New this summer will be the 5-6 oz bobbin/flyer. A jumbo flyer unit can be fashioned from an Ashford Jumbo flyer with my flyer shaft switched in. Jesus. So many wheel to try. How many wheels do you have if I may ask? Someone called me a collector once when I told them how many. I have two I'm keeping for my children when they grow up (fancy wheels -- a Van Eaton Fold N' Tote and the Betty Roberts); a Journey Wheel, a Majacraft, a Butterfly (e-spinner), and the children each have a wheel: the pocket wheel and a SpinOlution (DS shares that with the shop though, as it's the shop's wheel). I also have a Clemes & Clemes, but it's for demo mainly as it has scotch tension, double drive, and irish tension setups, so I use it when I teach. Then there's the Louet S-17 I haven't advertised yet ... So, "officially", I have 3, my two children each have two, and when I teach the C&C gets pulled out and run through its paces, and one I'm selling ... if I was at a SA meeting (Spinners Anonymous, they have that, right?) I guess they'd want me to admit that I have 9 wheels, and am working on making that 8. Oh, ouch. That hurt! Then they'd start in on how many charkas I have (only three, really, and one's in the to-sell bin). he he. Just don't ask me to count my spindles, that would take waaaay more rationalization than I'm capable of! I've owned other wheels in the past (not at the same time as many of these, though, most before these): A Louet S-10, two Ashford Traditionals (long story), a Lendrum, a Schacht Matchless, and a Majacraft Little Gem. And I got to play with a friend's Hitchhiker for a wheel, that was fun! When I looked at the Hitchhiker as a travel wheel I was rather put off by the extra movement from treadling. Do you find that with the lighter wheels or does the Pocket seem steadier when treadling? @FiberQat: thanks for asking. This early wheel didn't have rubber stoppers on the bottom, so I put it on a non-skid under-carpet type of matt when I spin on it, and don't see any travelling. That said, I do adjust my seat forward-and-back a bit when I first sit down to it each time, to give me the most comfortable angle of treadle. Doug now puts nice rubber stoppers on the underside, so I expect you'd only see travel if your angle of treadle was low, i.e., you were actually pushing the wheel away from you rather than moving the treadles up and down. Possible, but also avoidable by moving to sit a little closer -- unless your knees weren't liking the angle of treadle, which is something to watch out for with any wheel. This wheel looks great. I am wondering how smooth it is and also how quiet or noisy is it? @karrelle ... Smooth, yes; Quiet, yes. The pocket wheel has a nice easy treadle, I'd heard it compared to the Jensen Tina II, so I got my hands on a Tina II and tried it -- I think the Pocket Wheel actually treadles a bit more smoothly, to my foot. 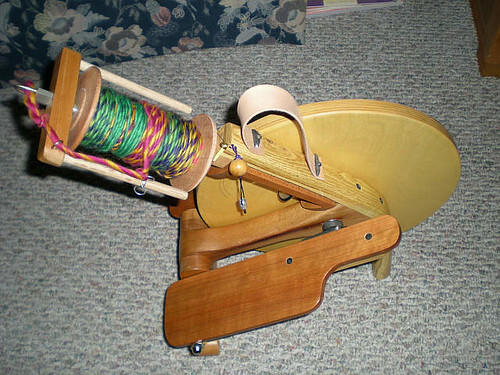 The Pocket Wheel can use a toe-only or a toe-heel style of treadling, whichever you prefer. It has a nylon scotch tension line, which is quite quiet on the bobbin. The drive wheel rolls a rubber-rimmed metal wheel to turn the bobbin, with no appreciable noise; it doesn't impact local conversation, and the TV stays at its non-spinning volume level. I am curious about the action of the new pocket wheels. How quiet is it? Is there any wobble to it? Mine's pretty darn quiet, and no wobble to speak of.